At the risk of getting my commenters riled up because I’m blogging about trivia, let me tell you what I had for lunch today: a pear, some cut up pineapple, and a bag of pretzel sticks. Believe it or not, about halfway through I suddenly remembered yesterday’s post about how we chew our food an average of ten times these days compared to 25 in the past, and I started counting chews. The pear took ten chews per bite. The pineapple about 13. The pretzel sticks about 15. This makes me suspicious of the claim that we modern Americans chew our food an average of ten times. That pear was ripe and soft and each bite still took ten chews. Short of chocolate pudding, I don’t think food comes much softer. 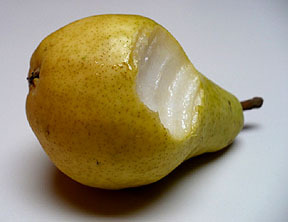 So if it took ten chews to finish up each bite of pear, I have to figure the average is quite a bit higher than that. Unless, of course, I chew my food more than most people. Surely, though, this is something the web excels at determining. So here’s your assignment: pay attention today to how many times you chew your food, and then report back in comments. I want data, people. Let’s get the hive mind cracking.